We study questionnaire responses to situations in which sacrificing one life may save many other lives. 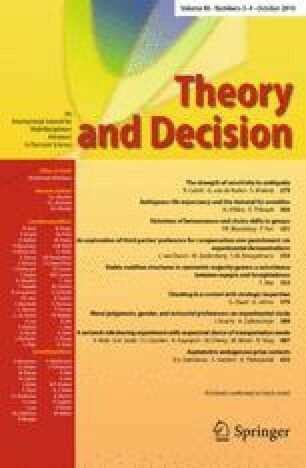 We demonstrate gender differences in moral judgments: males are more supportive of the sacrifice than females. We investigate a source of the endorsement of the sacrifice: antisocial preferences. First, we measure individual proneness to spiteful behavior, using an experimental game with monetary stakes. We demonstrate that spitefulness can be sizable—a fifth of our participants behave spitefully—but it is not associated with gender. Second, we find that gender is consistently associated with responses even when we account for individual differences in the propensity to spitefulness. We thank an associate editor and two anonymous referees for helping us improve the paper. This research has been supported by the French National Research Agency (ANR), through the program Investissements d’Avenir (ANR-10–LABX_93-01). The research has been performed within the framework of LABEX CORTEX (ANR-11-LABX-0042) of Universite de Lyon, within the program Investissements d’Avenir (ANR-11-IDEX-007) run by the French National Research Agency (ANR). Maxim Frolov, Ivan Ouss, and Rémi Yin assisted with the experimental sessions. We thank Daniel Bartels, Astrid Hopfensitz, Michal Krawczyk, Hela Maafi, David Masclet, Ernesto Reuben, seminar participants at the University of Crete and the University of Paris 8, at the GATE CNRS in Lyon, and at the 2015 ASFEE meeting in Paris for valuable comments. Adam Zylbersztejn is grateful to the University of Lyon 2 for support through ASPRE 2015 and AIP 2016. In each session, participants were asked to answer a standard questionnaire. We used the questionnaire to elicit demographic information. In addition, participants were required both to play an experimental game and to answer a moral judgment questionnaire. Below, we present the paper instructions (subsection 1), describe the instructions displayed on the participants’ computer screens (subsection 2), and present the moral judgment questionnaire (subsection 3). Sentences in brackets were not part of the instructions but rather descriptions of what happened. You are taking part in an experiment in which you can earn money. Your gains may depend on the decision made by another participant. Before we begin, we would like you to answer a few standard questions concerning your age, education, profession, etc. These questions will help us to get to learn something about your characteristics. Your identity and your monetary gains will remain confidential and anonymous. The experiment consists of two separate parts. In Part 1, your payment in the session will be determined. In Part 2, you will be asked to answer questions that will allow us to learn more about you. Further instructions will be displayed on your screen before the beginning of each part. Your total payment will the payoff you earn in Part 1 and a bonus of 5 Euros for completing the session. Payments are made individually and in cash. You are not allowed to talk during the experiment. Participants who violate this rule will be excluded from the experiment and payments. It is important that you perfectly understand the rules of this experiment. Should you have any questions, please raise your hand. In this part of the experiment, your additional payment will be determined. The game has two players: player A and player B. Only player A makes a decision, and this decision affects player B’s payoff only. You will be paired randomly with another participant. You will then be asked about the decision you would make as player A. Finally, at the end of the experiment, a random draw will determine your actual role in the pair. If you are player A, your decision will determine the other group member’s payoff. If you are player B, your payoff will be determined by player A. The game is played by two persons, player A and player B, and runs as follows. Player A’s payoff is fixed and equals 10 Euros. Player A decides about player B’s payoff. More precisely, player A selects an amount between 0 and 10 Euros which is then attributed to player B. Player A’s choice does not affect her own payoff. Player B makes no decision and her payoff corresponds to the amount determined by player A. Suppose that you are player A. What amount would you like to give to player B? In this part of the session, we ask you to answer a few questions. The answers will enable us to learn about some of your personal characteristics. We remind you that we are not able to link your answers with your identity. [Participants used a computer mouse to tick the appropriate box on a scale of\(-2,\ -1,\ 1,\ 2\). The leftmost box represents the strongest disagreement and the rightmost box corresponds to the highest agreement. You are the captain of a small military submarine traveling underneath a large iceberg. An on-board explosion has dramatically decreased the oxygen supply and has injured a member of the crew. He may die from his injuries. The remaining oxygen is not sufficient for the entire six-man crew to make it to the surface. If you shoot the injured crew member, there will be just enough oxygen for everyone else to survive. In this situation, would you shoot the crew member? You and a group of friends are backpacking, and while crossing a rocky plain in the Guatemalan highlands, you inadvertently camp on a local clan’s burial ground. The leader of the clan says that his clan’s laws command him to kill all six of you as a sacrifice to the gods, but that if you kill one of your own, the gods will be appeased, and the rest will be let go. In this situation, would you kill one of your friends? You are traveling with five other peace advocates in a war-torn country when your group is taken hostage by a group of terrorists. After a week, the terrorists’ demands have not been met, and they offer you a choice: either they will kill all of you, or if you execute one of your fellow hostages, you and the others will be free to go. In this situation, would you execute one of your fellow hostages? In the path of a runaway train car are five railway workmen who will surely be killed unless you, a bystander, do something. If you flip a switch, the train will be diverted onto another track, where it will kill a single railway workman. In this situation, would you flip the switch? You are on a small ship, a fire breaks out, and the ship has to be abandoned. Because your tiny life raft is carrying more than its capacity, it is sitting dangerously low in the water. The seas get rough and the raft begins to fill with water. Unless you do something, all six of you will drown. There is an injured person on board who may die either way. If you throw him overboard, everyone else will be saved. In this situation, would you throw him overboard? Your plane has crashed in the Himalayas. The only survivors are you, some other men, and a young boy. The six of you travel for days, battling extreme cold and wind. Your only chance of survival is to make it to a village a few days away. The boy cannot move very quickly. Without food, you and the other men will surely die. One of the men suggests killing the boy and eating his remains over the next few days. In this situation, would you sacrifice the boy? You and some other soldiers were captured. After a year in a prison camp, your group tried to escape but was caught. The warden has decided to hang your group in front of the other prisoners of war. At the gallows, he releases the noose from your neck and announces that if you pull the chair from underneath one man in your group, the remaining five will be set free; otherwise, you all die. He means what he says. In this situation, would you remove the chair? You are the late-night watchman in a hospital, where an accident has occurred in one of the on-site testing labs, and now, there are deadly fumes rising up through the hospital’s ventilation system. The fumes are headed to a certain area, where there are five patients who will surely die. If you flip a switch, the ventilation system will cause the fumes to bypass this room and enter a room containing a single patient, killing him. You and five others are exploring a seashore cave. A rock falls and blocks your exit. The tide is rising. You spot a hole elsewhere and let a large man in your group out first. He gets stuck, and unless you get out soon, everyone but this man (whose head is sticking out of the cave) will drown. You have a stick of dynamite that will not move the rock, but will blast the man out of the hole. He does not want to die; neither do you or the others. In this situation, would you blast him out? You are leading a group of soldiers returning from a completed mission in enemy territory when one of your men steps in a trap. He is injured, and the trap is connected to a device that alerts the enemy to your presence. If the enemy finds your group, all six of you will die. If you leave him behind, he will be killed, but the rest of the group will escape safely. In this situation, would you leave him behind? You are a surgeon with a number of patients. Five of them need organ transplants. Each of them needs a different organ or they will surely die. You have another patient who is healthy and would be an ideal organ donor for the others. If you transplant his organs (against his will) into the bodies of the other patients, they will live but he will die. In this situation, would you perform this transplant? In the path of a runaway train car are five railway workmen who will surely be killed unless you, a bystander, do something. If you flip a switch, the train will be diverted onto a set of tracks in need of repair. The train will be derailed and go down a hill, across a road, and into a man’s yard. The owner, sleeping in his hammock, will be killed. In the path of a runaway train car are five railway workmen who will surely be killed unless you, a bystander, do something. You are standing next to a larger stranger on a pedestrian walkway that arches over the tracks. Your body would be too light to stop the train, but if you push the stranger onto the tracks, killing him, his large body will stop the train. In this situation, would you push the man? Enemy soldiers have taken over your village and will kill all remaining civilians. You and five others are hiding in the cellar of a large house. Soldiers have come to search the house for valuables. A baby in your group begins to cry. Therefore, you cover her mouth, but she cannot breathe. If you remove your hand, the baby can breathe, but her crying will summon the soldiers who will kill everyone in the cellar. In this situation, would you smother the baby?